When did the Sumerians get started? About the same time as the first Pharaohs were coming to power in Egypt, around 3100 BC, a group of people we call the Sumerians were living in Mesopotamia. That’s the area between the Tigris and the Euphrates rivers, in West Asia (modern Iraq). Where did the Sumerians come from? The Sumerians themselves believed that they had come to the Euphrates from somewhere else, probably in boats from the Persian Gulf. And the first Sumerian cities were near the Persian Gulf, though they later spread out northward. But most archaeologists today think the Sumerians, or at least most Sumerians, had actually been in Iraq for a long time before they started to build cities. 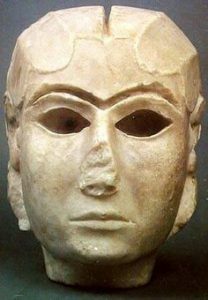 To their east, in modern Iran, the Sumerians had the people of Elam (the Elamites), who they both traded with and fought with, at different times. To their west, the Sumerians had the Amorites, who spoke a Semitic language (related to modern Hebrew and Arabic). Further west was the Levant, where people also spoke Semitic languages. To the north were the Yamnaya, who spoke an Indo-European language. Sumerian scribes seems to have begun to use writing by around 3000 BC, which allows us to know more about them, though we still can’t really read their earliest writing. Sumerian people also used bronze. Sumer may be the first place where metal-workers added tin to copper to make bronze, maybe because there is so little stone there for tools. The Sumerians built big temples, called ziggurats, and mud brick walls around their cities. They began big irrigation projects, digging canals and ditches to bring water from the Tigris and the Euphrates to the land between them so people could grow food there. With irrigation and farming, more people could live in the same amount of land. 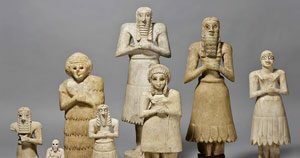 Make your own Sumerian figurines and cuneiform tablets with this clay! The Sumerians told a story that all this happened “before the flood”. In the Sumerian version there were seven kings before the flood, who had seven wise men (or half-gods) who helped them. The first of these wise men was Uanna-Adapa, whose name is Adam in the Bible. Then, the Sumerian texts and the Bible agree, the gods were angry with men and sent a great flood which destroyed everything, and only a few men survived to rebuild. The Sumerian texts place this event around 2900 BC. Was there really a flood? Archaeologists have looked for evidence of this flood in Sumer, and although it does not appear everywhere, it does seem that there was a serious flood in one area about this time. But probably the reason the Bible tells the same story is just that the people who wrote the Bible had Sumerian histories in front of them that they used as sources. Did you find out what you wanted to know? Let us know in the comments! The Sumerians, by Elaine Landau (1997). Despite the bad Amazon rating, this is a good solid introduction to the Sumerians, with an explanation of prehistory at the beginning for context. Pictures of ancient stuff, and good maps. Sumer and the Sumerians, by Harriet Crawford (1991). A college-level introduction, with a lot of archaeological material and daily life information. Cite this page: Carr, K.E. Who were the Sumerians? Mesopotamia – West Asian history. Quatr.us Study Guides, September 14, 2017. Web. April 25, 2019.